– Active ingredient: Each coated caplet contains Paracetamol 650 mg.
– Other ingredients: Maize starch, pregelatinized starch, methyl hydroxybenzoate, magnesium stearate, talc, povidone K30, sodium starch glycolate, colloidal silicon dioxide, gelatin, opadry II white. Blister of 10 coated caplets. Box of 1 blister and box of 10 blisters. Paracetamol is an analgesic and antipyretic. – Treatment of mild to moderate pain including: headache, pain in cold and flu, sorethroat, dysmenorrhoea, pain after vaccination or tooth extraction, toothache, migraine, pain of osteoarthritis. Dosage: every 4-6 hours as necessary. – Adults: 1 caplet. Do not exceed 6 caplets in 24 hours. – Children 7-12 years: ½ caplet. Do not exceed 3 caplets in 24 hours. Minimum dosing interval: 4 hours. 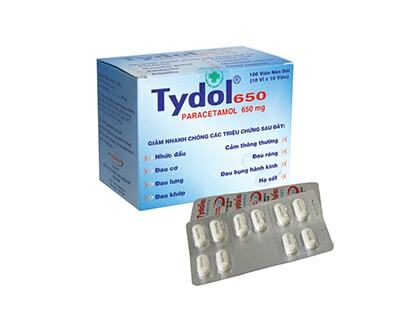 Note: Not to take TYDOL® 650 for pain for more than 10 days in adults and more than 5 days in chidren, or for fever (39.5oC) for more than 3 days unless directed by a doctor. Hypersensitivity to Paracetamol. Patiens with anemia, cardiopathy, pneumopathy, renopathy. Lacking G6PD; impaired hepatic function. Consult your doctor if symptoms persist or in case of severe liver or kidney impairment. Some products combined with sulfite cause allergy. Patients with phenylketonuria, aneamia, alcoholic. Should not be used with other products containing Paracetamol. Animal studies have not identified any risk to pregnancy or embryo-foetal development. Human studies have not identified any risk to lactation or the breast fed offspring. Paracetamol should be used during pregnancy only if clearly needed. Effects on ability to drive and use machines: None reported. Prolonged use and high dose of Paracetamol may cause hepatocellular insufficiency. Skin rash and other allergic reaction have been described rarely. In some rare cases, Paracetamol can reduce leukocyte, glomerule and blood cells. In case of an unexpected reaction, consult your physician. Used high dose of paracetamol may enhance anticoagulant of coumarins and indanediones. Concurrent use of paracetamol with phenothiazin may reduce serious fever. Alcohol, phenytoin, barbiturate, carbamazepine, isoniazid may increase the hepatotoxicity of paracetamol. Symptom: Nausea, vomiting, anorexia, pallor, abdominal pain. The diagnosis is very important in treatment of overdose of paracetamol. When severe poisoning, the supportive treatments are necessary. The gastric lavage in all of case is recommended and best treated around 4 hours after administration. The main detoxication therapy is the use of sulfhydryl compounds, may affect a part due to supplement of reserving the glutathione in liver. N-acetylcysteine have effect when taking oral or intravenous route. It should immediately take it before taking paracetamol for 36 hours. N-acetylcysteine therapy have effective when treating it for 10 hours after taking paracetamol. N-acetylcysteine solution is diluted with water or soft drinks in order to have a solution of 5% and its shelf life is around 1 hours. Taking 140 mg/kg of body weigh of N-acetylcysteine for the first dose, taking 70 mg/ kg of body weigh in next 17 dose. Interval of each administration is 4 hours. The therapy is terminated if paracetamol content in plasma don’t affect any toxicity of liver. STORAGE : Store at temperature from 150C to 300C. SHELF LIFE: 48 months from manufacturing date. Do not use after expiry date. Copyright © OPV Pharmaceuticals 2016. Click on the following icons to download latest browsers.